This is a poshed up version of a traditional Mediterranean street food. 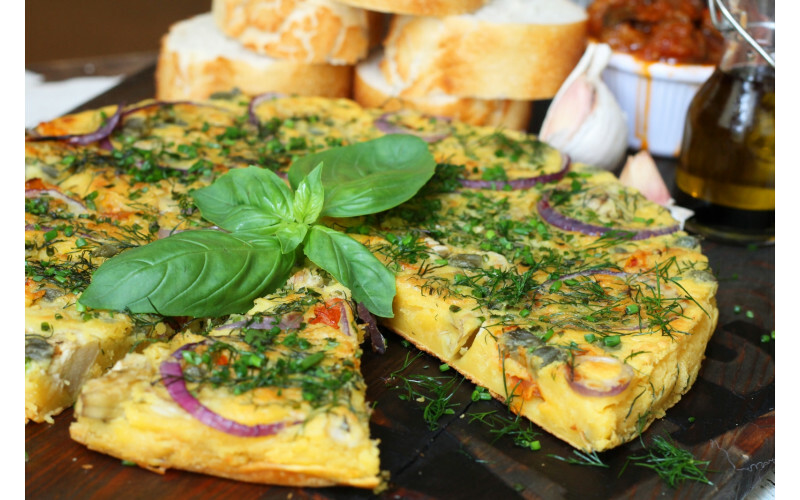 It's a mixture between a tortilla (omelette) and a savoury pancake and lends itself to different additions and different meals - breakfast, lunch, supper. It's also great cold as a kind of finger food. It's also cheap as chips! Chickpea flour (also known as gram or besan flour) is inherently gluten-free and is widely available: World Food shelves in larger supermarket branches; Asian and other international grocers; health food shops. Brands to look out for include Dove's Farm, Sainsbury's, Elephant and Natco. Pour the warm water into a large bowl and sieve the gram flour into it plus the vegan bouillon. Make sure you whisk constantly to avoid lumps. Cover the bowl with cling film and leave for at least a couple of hours - or overnight. Preheat the oven to 220°C (fan)/450ºF/Gas Mark 7. You can be prepping the rest of the ingredients now if you wish. Remove any foam that has formed on top of the batter and then stir in the 1 tbsp olive oil, dill, chives, salt and pepper. Line the bottom of a baking tray (or oven proof skillet) with the 1-2 tbsp oil so it forms a thin coating. Heat in the oven for a few minutes until smoking hot. When the oil is hot enough, remove the tray from the oven and pour in the batter. Then add the olives, artichoke hearts, sun dried tomatoes, capers, red onion and vegan cheese chunks (optional). Or try the potato and pea option - see above! Bake in the oven until set and golden brown on top, approximately 15-20 minutes. Let it cool slightly then cut into triangles or squares to serve and sprinkle with the extra dill and chives for garnish.